If I had to pick one type of dessert to eat for the rest of my life, it would be pie. I'm not really a big cake fan, and cookies are okay, but pie is pretty much perfection to me. Especially if it's pumpkin, or coconut custard, or apple. Like everything else in my life, I'm very particular about my favorite pies. 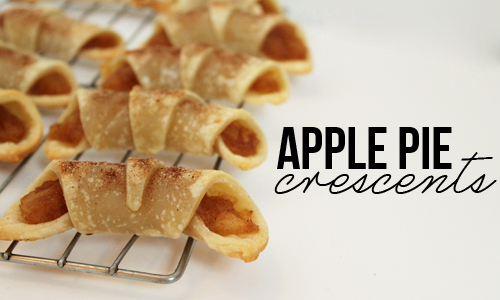 These little crescents are a perfect treat for those of us who can't to control themselves around pie. They're everything you want in a piece of apple pie: buttery crust, sweet appley filling, hint of cinnamon. The best thing is this recipe can be as easy or as homemade as you want. I used jazzed-up canned pie filling and refrigerated pie crust, but you could just as easily swap out your favorite crust or filling recipe to control the flavors. Open your pie crust and mix in cinnamon, nutmeg, and salt. In a large saucepan, add the apples and caramelize for 5-10 minutes. Add into the bowl of a food processor and pulse until the apples are broken down, but still have a few chunks. Set aside. Unroll your pie crust and cut into fourths. Cut each fourth into three pieces. Take one slice and begin stretching out the widest side so it is about a half inch wider on both sides. Spoon a tablespoon of filling on the widest end and roll the crust down to the narrowest point. Once rolled up, turn the ends towards each other to create a crescent shape. 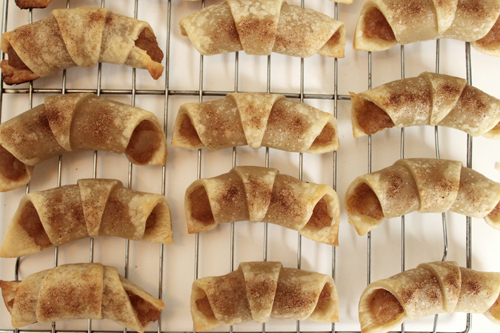 Place crescents on a parchment- or Silpat-lined baking sheet and brush lightly with an egg wash. Top with cinnamon and sugar and bake for 7-10 minutes. Once the edges begin to brown, remove from oven and let cool on a cooling rack. Enjoy. Like little apple pie two-bite cookies! Great with a cup of tea as an after-dinner snack. Guys, it's fall! 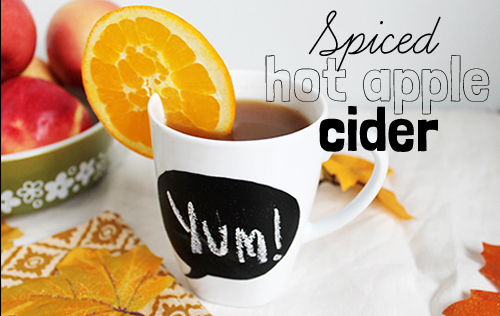 And if you removed chai tea lattes, pumpkin spice lattes (PSL), and hot tea out of my life, I would be left with the deliciousness that is spiced apple cider. In the chillier months, I love to spend my nights snuggled up on the sofa with my heated blanket, computer, a mug of hot apple cider and preferably two kitties and a boyfriend. This is another super easy recipe and can even be made in a crock pot or in larger batches for a seasonal party. Throw all ingredients into a pot and simmer for 3-5 minutes until hot. Stir occasionally. Once the cider is hot, remove the orange slices and you can either strain out some of the spices with a fine mesh strainer, spoon some of it off the top, or stir and drink as is. If I was having guests and serving this for a party, I would probably pour it through a strainer. But for just me, I'm fine with just spooning some of it off or leaving it alone. I'm easy. 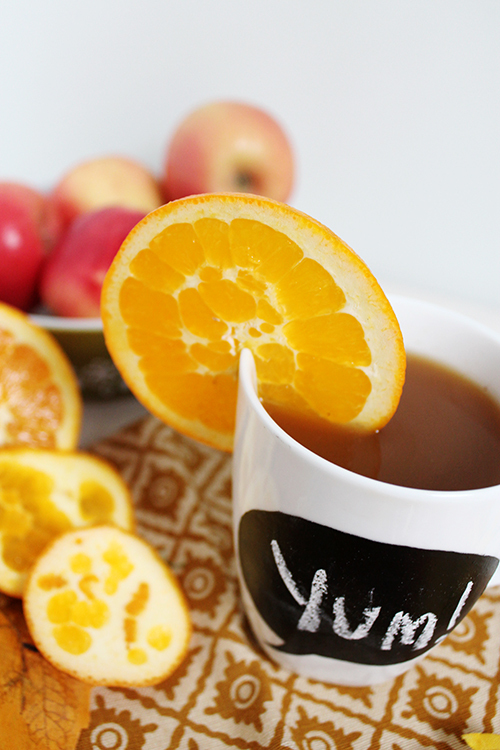 Garnish with a cinnamon stick and some orange slices. 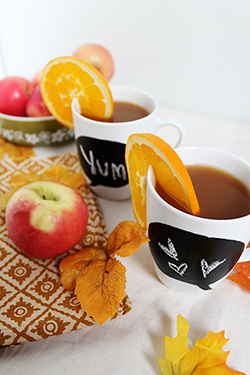 Now that we are in the full swing of fall, stay tuned for apple and pumpkin treats for the next month or two! 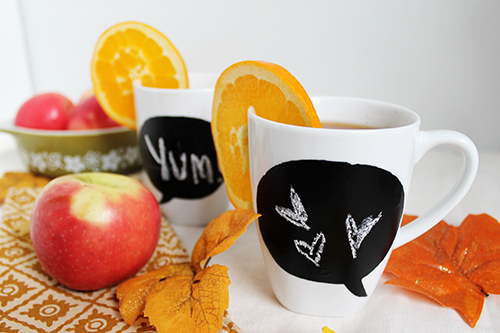 Also, chalkboard speech bubble mugs make ever drink better! That's a promise.